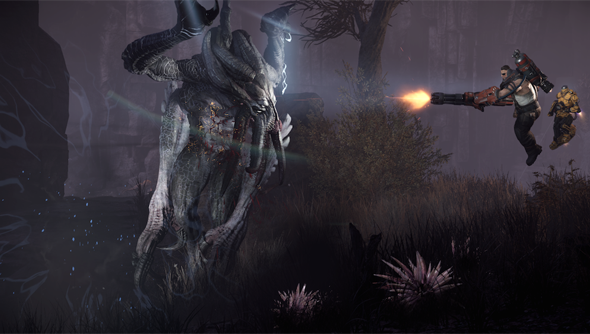 Much of the Evolve footage we’ve seen to date has stuck the camera – and the responsibility of selling the game – with the hunters. Presumably because they’re the known quantity: men with guns. But it’s the other bit we need to see to understand. Forget the survival horror experience for a moment: this is what it’s like to play as the horror. Bewarned: YouTuber jackfrags won’t stop talking at any point during the duration of the video. That’s more or less his job. But if you can stomach that, he’s captured nearly half an hour of play as the Kraken. So what haven’t we seen before? I don’t remember seeing the monster use sheer size to clamber up to vantage points above the heads of human players before now. Those sections of the map recall Left 4 Dead’s undead-only off-stage areas, and give the Kraken a view over the chasms below. The hunt really is just that to begin with – the monster doesn’t want to be found until they’ve munched through enough creeps to max out their abilities. Until then, it’s a process of on-off stealth – dodging flocks of birds telegraphed with big, red exclamation marks. Like the monster segments in Giants: Citizen Kabuto, the pulled-back perspective can’t help but change your outlook on the map and its denizens. The sense is that the monster player is swatting away flies until ready to grant them their whole attention – or until the flies grab their notice by erecting a forcefield to entrap them. I suppose that’s where the metaphor breaks down. Rob voiced his concerns about Evolve in June. Are you worried about the potential variety of endless tank battles? Or does footage like this help crush those concerns like so many creeps?